Global Capacity, a major connectivity-as-a-service provider, has announced a partnership with VeloCloud Networks, the Cloud-Delivered SD-WAN company, to enable the delivery of managed SD-WAN services. The partnership with VeloCloud is part of Global Capacity's initiative to expand its global enterprise networking portfolio with new software defined services that can offer enhanced flexibility, performance and reliability. Global Capacity's SD-WAN services are designed to provide an improved network service by addressing common WAN problems that businesses face when implementing and managing complex hybrid WAN architectures. The company cited enterprise network issues including difficulty in load sharing traffic across a mix of access connections, complex, static and manual network configurations that inhibit mapping to business requirements and lack of application visibility and control over connections. 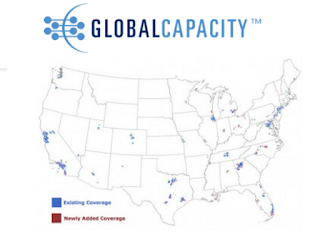 Global Capacity's SD-WAN services are designed to allow businesses to efficiently route data across their WAN via: enabling selection of the appropriate access types based on the performance needs of individual locations and applications; defining the policies to automatically prioritise traffic; and enabling more efficient use of bandwidth to enhance performance and the overall user experience. Working with VeloCloud Global Capacity has developed a managed SD-WAN service that unifies network management across disparate network technologies, including Ethernet, MPLS, broadband and LTE, whether these are on the Global Capacity network, a competing network or a combination of the two. This is designed to enable a more agile and responsive hybrid WAN solution and to offer a simplified path for migration from an existing network architecture. In January, Global Capacity launched the Ethernet Multi-Cloud Connect service, a virtual network service based on its One Marketplace software-defined network platform that allows enterprises to build multiple cloud services from a single port to access hybrid and multi-cloud solutions across multiple locations. The Ethernet Multi-Cloud Connect service employs an interconnection architecture with software orchestration to simplify multi-cloud connectivity and improve service performance. The solution enables businesses to connect to cloud locations or select from a list of interconnected One Marketplace Cloud destinations, including AWS, Google Cloud, Microsoft Azure and twenty cloud providers on the Equinix Cloud Exchange.